Note: The jvm.options file is available for DSE versions 5.1 and later. For more information on JVM, see Tuning Java resources. Click the edit icon for the configuration profile you want to edit, or click Add config profile if you have not already added a config profile. 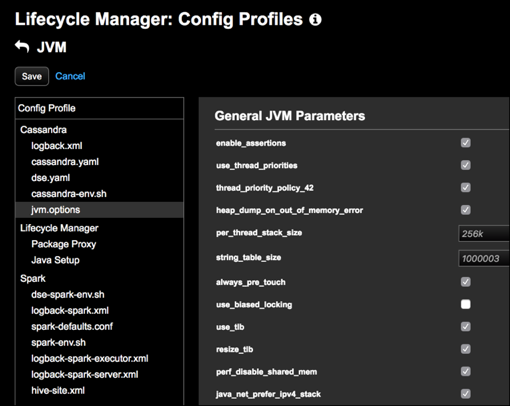 In the Config Profile pane under the Lifecycle Manager section, click jvm.options. The General JVM Parameters pane for configuring JVM options appears. Adjust the default settings as appropriate for your environment. Tip: Click Show Field Descriptions to view available tooltips for fields. Click Save to save the Config Profile.